If the British are preoccupied with the weather – and apparently 70 per cent of us check the weather forecast at least once a day – then British track cyclists are totally weather obsessed. That obsession is never worse than when we are contemplating a trip from Worcestershire to Dundee for a round of the National Omnium Series. The track in Dundee is so close to the coast, that the chances of meteorological misfortune are very high indeed and that would mean a lot of wasted time. I always start checking the BBC weather forecast a few days out from a track meeting when they are held on outdoor velodromes. This time, with hotel rooms to be booked, the ritual started early and became a twice daily fixation, as I watched weather systems come and go with weather that would most definitely have stopped us from racing, changing to sunshine and then back to rain again. So when we started the long journey north, we were still not sure we would actually get to turn a pedal in anger and after eight hours on the road I was starting to lose some of my love for the uncertainty in our adventure. However, when race day dawned it seemed Scotland had some of the best weather on offer in the British Isles – I actually had to go out and buy sun cream and since my husband’s golf clubs had taken the space in the car that is usually reserved for the TORQ gazebo, we had to shelter from the sun under a couple of trees. It was in fact, a completely gorgeous day from dawn until dusk. Yes, the wind could have been described as “brisk” and at times “downright gusty”, catching my front wheel (we choose the FFWD with a 50 mm rim because we hadn’t even packed the 90), but there was never any question that we would get a full programme of racing in. The organiser Martin Harris does an incredible job with this meeting and the event is really well run. There are races for all ages and the juniors that are part of the Discovery Club and who call Caird Park home, turn out in force and behave in a wonderfully sporting manner. Personally I think it is only right that the National Series is truly national and with this round in Scotland balanced with omniums in London, the Midlands, Berkshire and Wales, I think it has been very well represented this year. That is not to dismiss the commitment required to support it but, if track racing is your thing, then you are going to have to travel a bit to indulge your passion and, in that respect I have to salute Sophie Black, who has travelled over from the Isle of Man to support all five rounds of the series this year and is planning to contest the final round at the Olympic Velodrome in September as well. As is always the case, the racing in Dundee was feisty, with lots of attacking in the bunch races and some good times posted in the TTs as well. 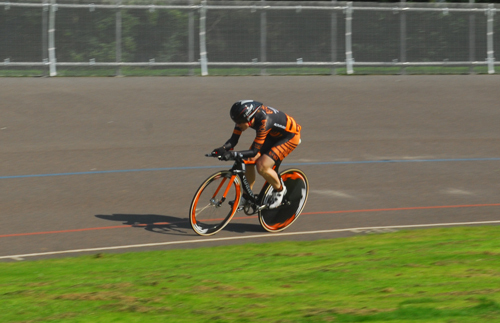 Our event got underway with a one lap TT, with the start procedure that is so unique to Scotland. It goes like this: “ready in the home straight, ready in the back straight, take hold, over to you Mr Starter” and then after some random interval a gun is fired – it is the “take hold” bit that always gets me smiling and perhaps suggests my focus is not 100%! Anyway, I managed to “take hold” and launch myself into a TT that was good enough to earn just one point and this reassured me that the eight hour drive had not dulled my legs too much. It was a pattern I was able to reproduce in all five of the events that make up the omnium and so the long journey north was justified despite its carbon footprint. 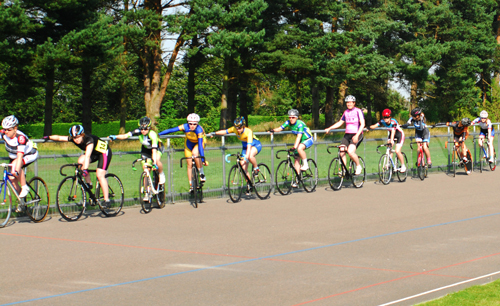 The more interesting battle was for second place, which went all the way to the very final sprint in the last event, the scratch race. Going into this race Flora Giles was in second place, just one point ahead of Sophie Black, who, to be fair to her, was clearly not on her usual form. To move up to second, Sophie needed to beat Flora over the line and given how the other races had played out this was going to require a big effort. 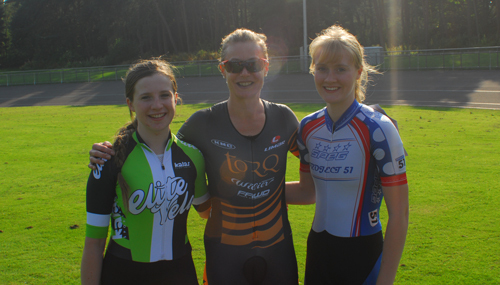 I have enjoyed racing with Sophie this year, so I was really pleased when she secured second place in the scratch, which was enough to take second place in the Omnium Overall. The final round of this Series is in the Olympic velodrome in September, but before then we have the rain-delayed Derny Champs and some TTs to negotiate.